← Is This a Match? Are Both Photos of the Same Dog? Yes! One of the most overlooked ways to get the word out about your missing dog is placing an ad in your local newspaper or shopper. 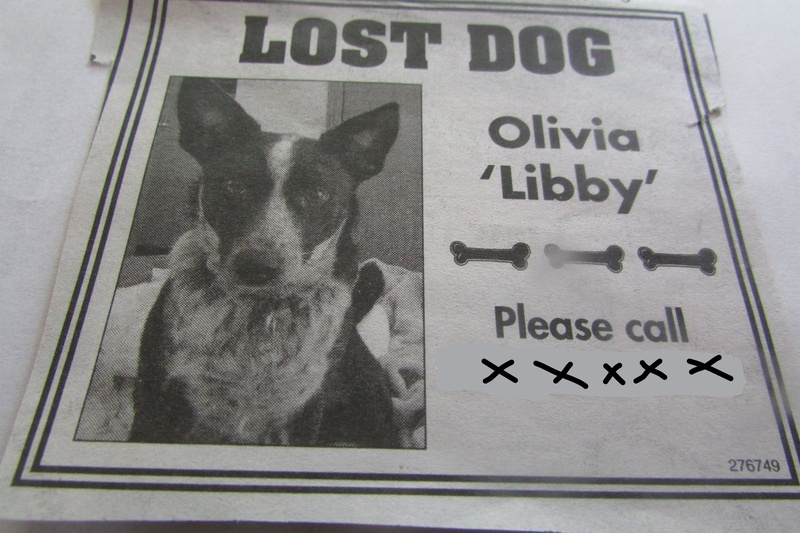 Libby, the Australian Cattle Dog from Kenosha, Wisconsin was found because her owners placed a $54 ad in their local shopper. Someone saw the ad and called to say they had seen Libby. Libby’s owners headed to the location with their other dog. She came out of hiding when she recognized them. Libby had been missing for two weeks when the owners got that important phone call. Social media has taken the world by storm, providing a cheap, easy way to spread the word; but you must always remember that there are still many people that don’t use computers or social media. It doesn’t do any good to have your dog posted only on Facebook if the person who sees your dog isn’t a Facebook user. So it is really important to use as many different communication methods as possible including flyers, signs, social media, Craigslist, newspaper and radio ads. Generating sightings is the key to getting your dog home safely. Remember that lost dogs can travel far and wide. Don’t limit yourself to just one area. Cover surrounding counties as well. Your dog is depending on you to bring him safely home. This entry was posted in Generating Sightings, Useful Tools and tagged Generating Sightings, Lost Dogs of Wisconsin, newspapers, Shoppers. Bookmark the permalink.